March 2013 – CREATE. PLAY. TRANSFORM. Acquaintances start from an introduction. It all begins with a handshake, a smile, an exchange of pleasantries, sharing each other’s names, etc. Handmade pieces, formed with clay, introduced themselves to me, by leaving a strong impact with the way I see Ceramics then and now. Through word of mouth, a pottery exhibition of a celebrated Ceramicist, has reached my ears in 2005. I was only in my third year, getting my hands dirty with clay then. I try to meet the potters in the country whenever I can. I usually meet them in their pottery exhibitions in Manila. I didn’t make it to the opening of the pottery exhibition. I came a few days after and I was greeted by the creative presence of her pieces in the show. Each piece stood on the pedestals with pride and dignity. The clay artist knows her materials and process in creating full well. From my old home in White Plains, I drove (when I still had my car) to The Vargas Museum at the University of the Philippine in Diliman, Quezon City. Traffic was not terrible then. I could still remember, rushing to see Nelfa’s show for the very first time. I have not seen her works before 2005. To be able see, a retrospective show of her pieces, would be a great way, to educate myself with the forms and boundaries of clay, if there were any. Seeing Nelfa’s works, I realized, that there are no limits in creating pieces out of clay. The only limit would be, not being able to form anything at all. As I step into The Edge Gallery at the Vargas Museum, I was speechless. The show was entitled, “Patterned and Inscribed: The Art of Nelfa Querubin from 1973 to 2003.” The textured clay of her works caught my attention. I have not seen anything like what she has created. The patterns and forms produced by her soul and hands, permanently inscribed an image of passion for clay within my spirit. For a beginner like me in pottery then, she got me hooked to forming clay even more. An artist’s talk on Ceramics was organized then. Nelfa talked about her works and her favorite pieces from abroad, materials, and some technicalities of working with clay, experimenting with different glazes and firing the kiln. I came right on time and sat on the first row. I was surrounded by students from the university. We were all excited to hear her story, see her works that are not included in the show, and we were all overwhelmed, to see a glimpse of the things that inspire her. After the talk, I introduced myself to her. I think I appeared to be some crazy girl in my early 20’s, losing my mind with clay and fire. The good thing about it, is that Nelfa herself, is as crazy as I am in making pottery too! We shook hands and I introduced myself. We laughed and we chatted. I made sure that I was not making the other students wait in line too long. Towards the end of our conversation, we exchanged e-mail addresses. When hands meet, a connection happens. Two strangers meet with one thing in common: Passion for making pottery. The more I get to know the artist, the more I discover the common things we both share. 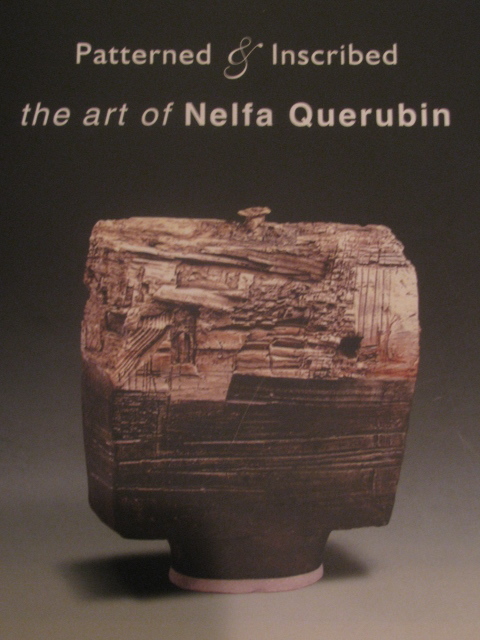 Meeting Nelfa Querubin-Tompkins that day was the starting point of my passion for Ceramics. She went back to Denver, Colorado, where she currently lives with her husband, Michael Tompkins. We continued living through life, working with clay. In the following articles, get to know the Artist, who has inspired a lot of Potters in the Philippines and abroad. See her works and know what inspires her to create beautiful pieces out of clay. After forty years of working with clay, what has she decided to continue pursuing? Nelfa Querubin-Tompkins is currently in Manila, Philippines. Her show entitled, “Terrain”, can be seen at the Ayala Museum’s Artist Space. See her works from 1973 until 2012. The retrospective show in Ceramics will run for two months. Izukan Gallery in Makati City is also showing her most recent works from 2011-2012. The show is ongoing until April 2013. Nelfa is going to launch her book, “Peace and Joy” in March 9th, 2013 at the Liongoren Gallery in Cubao, Quezon City. These shows in Manila, Philippines, are not to be missed!